Who are the heroes of Earth 2? 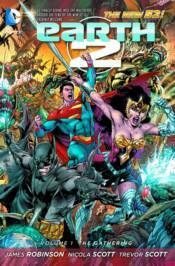 When Batman, Wonder Woman and Superman of Earth 2 fall in battle, it's up to a new breed of heroes to come together to combat the returning evil of Apokolips! Collecting issues #1-6 of the DC COMICS-THE NEW 52 series!